No hay bales in this picture, but it shows the mountains. This is Two-fer Tuesday on Robert Lee Brewer’s blog. You can write a poem about gathering, a poem about letting go, or a poem about both. Click on the link to read the contributions of the usual suspects and to write your own. 2012 November PAD Chapbook Challenge: Day 20 | Gathering Poem | Letting Go | WritersDigest.com. via Write a Poem about Gathering or Letting Go. 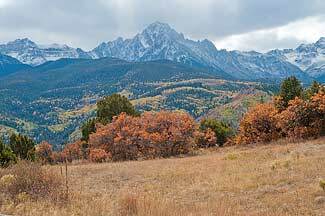 Yesterday, we drove up into the high country near Ridgway, Colorado. My husband is a railfan, which means we take pictures of trains. Years ago, when we lived in the city, we spent our summers in Ouray. We drove down to watch the weekly train come into Ridgway to pick up its load of concentrated lead and zinc ore trucked down from mines higher in the San Juans. The track is long gone and part of its right-of-way is under the waters of the Ridgway Reservoir, but, with the aid of our photographs, we were able to figure out where the yards had been.